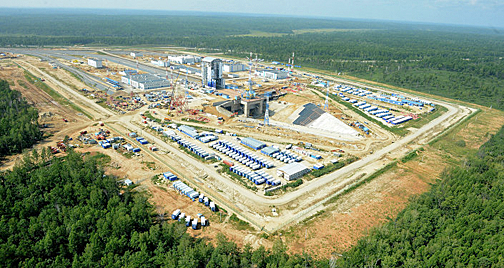 Photo of Russia's Vostochny Cosmodrome is courtesy of Sputnik News. Being reported by Russian news agency TASS is that high alert regime of safety and emergency measures will be introduced today in Russia’s Amur Region, just ahead of a Soyuz 2.1b rocket launch from the Vostochny Cosmodrome, this according to the press service of the regional emergency situations agency. The press release received by Tass stated, "The high alert regime for all emergency situations response teams in the Amur Region will be introduced starting at 6:00 p.m. local time (12:00 Moscow time) on November 27." Safety measures during the launch of a Soyuz-2.1b will be provided by some 400 people as well as by 85 units of equipment, including four helicopters. The Soyuz-2.1b carrier rocket is planned to blast off with Russia’s Meteor-M Earth remote sensing satellite on November 28 from the launch site in the far east of Russia. This will be the second space launch from the Vostochny Cosmodrome, which is Russia’s first civil spaceport. The inaugural launch from the Cosmodrome occurred in April of 2016, when a carrier rocket orbited three satellites.